This lovely downtown Arts and Crafts gem offers two floors of spacious comfort full of the owner artist's original works. It is the perfect alternative for families, friends, and business travelers who appreciate a peaceful hideaway in an atmosphere of art, culture and history. With its own private entrance, this 1350 sq. ft. rental provides absolute privacy and a charming English-style courtyard for your exclusive use. High speed wireless internet, cable and Netflix. 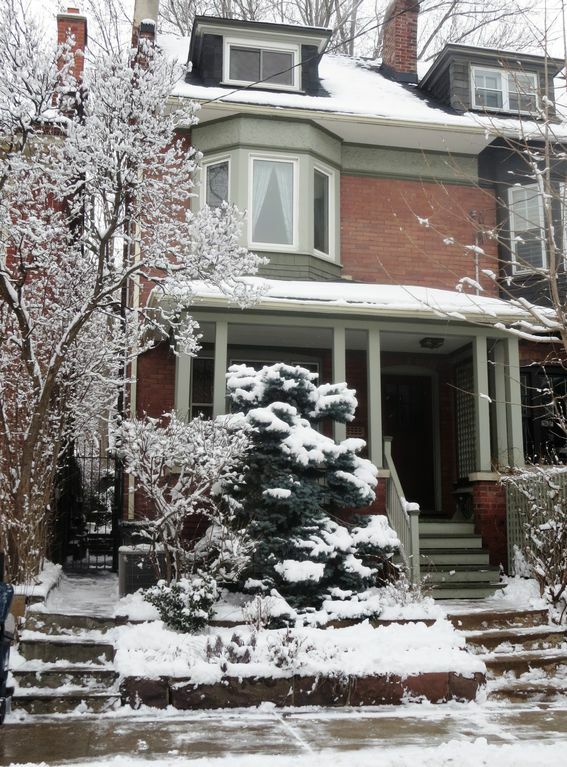 This historically designated Arts and Crafts style home, circa 1913 is situated in the safe upscale community of Cabbagetown located in the heart of Toronto. This vacation rental includes two floors (main and garden level) of absolute privacy in an apartment with a separate entrance, approx. 1350 square feet, with an outdoor deck and private walled in courtyard for your exclusive use. This fully private and furnished self-catering unit is a perfect alternative for vacationers or business travelers who appreciate a peaceful hideaway in an atmosphere of culture and history; in fact you wouldn't know you were in the middle of Canada’s largest city! This home provides what a hotel room cannot, space for friends and family traveling together to enjoy a beautiful common space to relax and dine in an affordable way. The area is perfect for architecture buffs (the New York Times described it as the largest enclave of restored Victorian homes in North America) and this century home on a quiet, beautiful tree-lined street features an old-fashioned front porch shaded by wisteria and a gingko tree ( Frank Lloyd Wright’s favourite combination). The gardens are designed with authentic arts and crafts principles inspired by British garden designer Gertrude Jekyll. The rental space includes a fully equipped kitchen with stainless steel fridge and dishwasher, a microwave, a gas stove and wall oven. There are two bedrooms, one with a queen size mattress, dresser and a built in closet with mirrored doors. The other bedroom with the twin set does not have a door; a thick curtain separates it from a large open space with a mirrored dresser, closet and seating area. There is a bathroom with a shower, marble vanity and deep soaker tub. There are three area with mirrors and hairdryers, especially suited to those getting ready for weddings. Many original features are intact such as Southern Georgia pine floors, high baseboards, historic mouldings, a pocket door and a wood burning fireplace in a spacious and comfortable living room and separate dining room. There are beautiful botanical dishes and a fully equipped kitchen to create delicious gourmet meals. The property owner is a fine artist whose original paintings you will find throughout the apartment; in fact you may find yourself feeling you are staying in an art gallery! You can walk most everywhere, a car is unnecessary but if you need a car, the Green P lot across the street has Zipcar rentals. Parking is available at a Green P lot just a few steps away, OR you can easily order a temporary parking pass from the City of Toronto. A weekly pass is $25.10 in total. There are streetcar and bus routes just around the corner and within a few short blocks you will find every amenity you will need for a comfortable stay. There are coffee shops (Starbucks, Jet Fuel, and Tim Hortons at the corner), gourmet delis (Daniel et Daniel, the best croissants and pain chocolat in Toronto, St. Jamestown Steaks & Chops, the Epicure for deli meats and gourmet cheeses), award-winning restaurants (F’Amelia and the House on Parliament), liquor and beer stores, No Frills and organic grocery stores, and even a few rare breeds at Riverdale Farm a few blocks away! Toronto is Canada's largest city, the fourth largest in North America, and home to a diverse population of about 2.8 million people. It is a global centre for business, finance, arts and culture and is consistently ranked one of the world's most livable cities. For information on non-emergency City services and programs, Toronto residents, businesses and visitors can visit http://www.toronto.ca, or call 311, 24 hours a day, 7 days a week. I'm a fine artist (painter) and writer, and now an innkeeper, too! Cabbagetown is a magical place, and my property has that special energy. I've wanted to live here all my life and almost 20 years ago my dream came true. Now I enjoy sharing this dream home with you and with the global community. Authentic Arts and Crafts home with original features, heritage protected by the City of Toronto. I'm the owner and live upstairs so will be here to greet you upon arrival and offer suggestions for whatever you may require to make your stay a memorable one. The vanity has a marble top and there is a deep soaker tub, along with two professional hairdryers and two separate areas for 'getting ready'.. In the heart of Toronto's most historic and coveted neighbourhood. There is a landline provided to call out, specifically for emergencies and local calls. It does not ring. Sheets, blankets, and duvets are provided for each room. There are extra blankets in addition to the duvets on the beds. Wood burning. Please ask before use. An on street temporary parking pass can be purchased online for $25.10 weekly. Unlimited high speed WIFI. Access code can be found in the manual on the kitchen table. The linen drawer is well stocked with lots of large towels, hand towels and face cloths. There are special grey facecloths for makeip removal. Professional dishwasher with dishwashing tabs are under the sink. Don't forget to unwrap them! The refrigerator is stocked with basics such as ketchup, mustard, pop, water, etc. The freezer has ice cubes and often you may find some ice cream treats! There is a gas stove, you simply turn the button all the way to the end and it lights. Please ask if you've never used one before. The oven is a large electric, and a nice one for your back because you don't need to bend over. There is an over-the-range large capacity microwave. Breakfast supplies are included plus a fully stocked kitchen, pantry and spice cabinet. Everything you need to create gourmet meals. Settings for eight plus lots of glasses. There is a large bright kitchen which is fully equipped with everything you might find at home. There is a table and four chairs within the kitchen area. A a self-service breakfast is provided. There is a table in the kitchen that seats four people. In the dining room there is a pine table which will seat six. Table linens are provided. There is a table in the garden that seats two. Netflix provided free of charge on channel 1311. A wide variety of channels is available including NETFLIX, sports and children's shows. There is a stereo that can be used for the radio or listening to music. Also for Ipod & Iphone. Lots of books and magazines including award-winning books for children. Trivial Pursuit, Scrabble, Boggle, a deck of cards and card games. Wide variety of CDs. If you have a favourite type of music please let us know so that we can try and have it available for you. Stuffed animals and award-winning children's books. Beautiful gardens in the front and back of the property. Private walled English-style courtyard garden for your exclusive use. There is bike sharing a half block away and I have two helmets and safety lights for loan. A private cedar deck with seating for six plus lanterns and lights for outdoor dining. There is also a private walled courtyard with an English-style garden. In summer a free city owned pool is about a 20 minute walk away. A new indoor pool complex with slide is approximately 10 blocks away. You can explore the Don Valley trails at the end of the street for long hikes and bike rides (city rental bikes are available close by) and the historical Distillery District is a 15-20 minute walk. It’s a quick walk, transit or cab ride to the Eaton Centre, Massey Hall, the financial district, the high end shops of Yorkville, the Hockey Hall of Fame, the University of Toronto, Ryerson and George Brown College, world class hospitals, Queen’s Park, theatre, ballet, opera, the Art Gallery of Ontario, the Royal Ontario Museum, the Toronto International Film Festival (TIFF), St. Lawrence and Kensington Markets, Pride, the trendy Queen Street shops, the Cabbagetown Arts Festival and Tour of Homes, the Toronto waterfront, CN Tower, Scotiabank Arena, Rogers Skydome and the new Ripley’s Aquarium. We had a wonderfully perfect 9-day stay in Victoria's apartment; she warmly greeted us with a fruit, cheese, and cracker tray at the end of a long day of travel. She gave us lots of information to help us adjust to our new surroundings (our first visit to Toronto), also providing a detailed folder with answers to many questions, and the rest was a fun discovery of our own. We quickly felt comfortable and acclimated. She manages to provide all you may need while still retaining the quaint and quiet atmosphere of the Arts and Crafts neighborhood. All the rooms are very clean, the beds very comfortable, and the entire space felt like a home away from home. We also enjoyed her beautifully colorful artwork displayed throughout, and the coffee-table books including the history of Cabbagetown. The location was also excellent, as downtown is a short Street-car/subway ride away, but the surrounding neighborhood has anything you could need within minutes walking time, and you do not feel as if you are located in a downtown area when you are at the home. We will definitely recommend her place to anyone wanting to visit the Toronto area. Beautiful place! Stylish, homey and comfortable. Great neighborhood. Easy to get anywhere. The place is cared for, designed beautifully. Everything you need is there. This is a little gem in a concrete jungle. Victoria greeted us warmly and gave us a detailed tour of the apartment. It is cute, clean and cozy. A cheese and fruit plate on our arrival was a very welcoming touch as we had a long day of travel. an artist and the original paintings are stunning. We loved that we could take postcards with her paintings on it home for souvenirs. They will be going all over the world! Victoria is a welcoming, attentive host and her place is a wonderful haven in the heart of Cabbagetown full of art, books, and warmth. Thanks so much from Peter, Annmarie, and especially Katie! This apartment is on 2 levels of a thouse. Victoria is lovely hostess and the neighborhood is great. The property is very clean and well decorated. Really good restaurants and charming shops nearby. Start to finish this home was truly a home for myself and 3 lady friends for a week. We arrived on a festive Halloween evening. We took public transportation or Uber/Lyft to downtown convention center and entertainment district, easily. The host is exceptionally warm and welcoming. The neighborhood, Cabbagetown, is friendly and interesting. We had everything we needed to cook gourmet meals and entertain friends.. The beds were comfortable and I slept well. I look forward to returning to Cabbagetown & the great city of Toronto!